For nearly 20 years, iCohere has been serving clients of all sizes, in the Associations, Government, Healthcare, Education, and Business sectors and sole practitioners. We have both "reusable license pool" and "All-Members" subscriptions. iCohere has been bringing full-service technology solutions to small, medium and large associations, nonprofits, and government agencies since 2001. Our cloud-based Unified Learning System seamlessly integrates webinars, courses, hybrid and virtual conferences, and online communities into one easy-to-use platform. Deliver a more collaborative, engaging experience for your organization, and gain access to all the platform features with cost-effective pricing based only on the number of users. 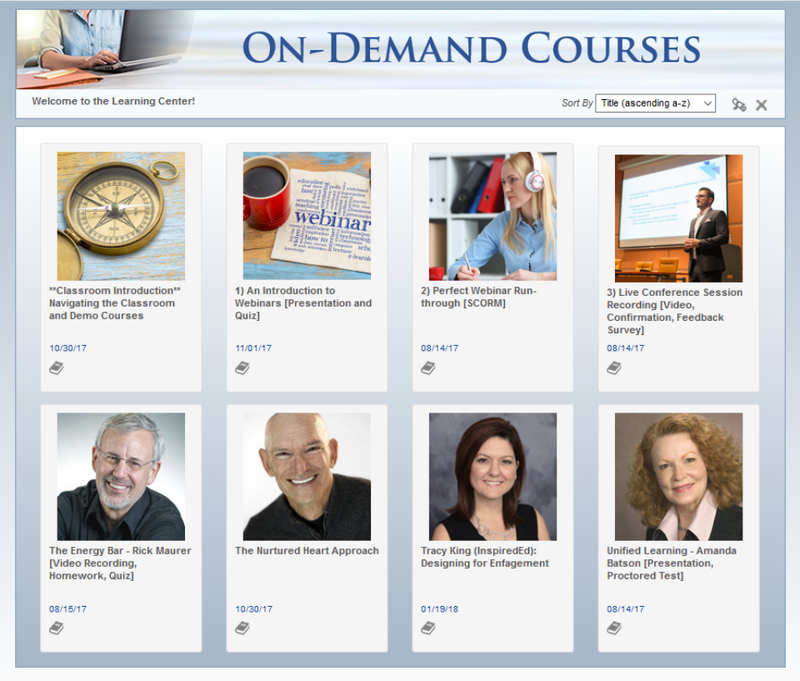 iCohere Unified Learning System Reviews Recently Reviewed! iCohere is a winner for us! It was the right choice. Pros: It provides a fully integrated solution to our training and technical assistance needs, including webinars, communities of interest, virtual meetings/conferences, and online/on-demand courses. It is much more economical in terms of staff time than trying to work with stand-alone solutions that operate differently and require enormous amounts of back-end labor to jury-rig and coordinate. Cons: iCohere is so feature rich (that's a compliment, not a complaint!) that it can be somewhat daunting at first. However, I recommend: (a) taking full advantage of the excellent online training materials in the iCohere Academy; and (b) prioritize your goals and build out your iCohere content incrementally focusing on your most highly valued goals and objectives first. As you succeed with each module, your confidence and competence will grow apace. Overall: We are currently ramping up nicely with iCohere. 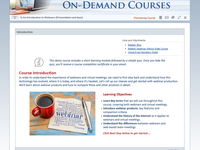 We've built up several training modules by repurposing existing webinars; eventually, those modules will be grouped into online courses. So far, both the iCohere platform and the service have been excellent - flexible, easy to learn, and feature rich. I'm very pleased with our progress so far; in addition, iCohere has been an important part of our sales pitch to grantors, and it seems to be working! I've been actively seeking out and using your online learning resources - they are excellent! Recommendations to other buyers: The support team at iCohere is excellent and provides a diversity of resources to help you succeed. I prefer to use the online training webinars in the iCohere Academy, but one of my staff prefers phone calls or emails to solve problems. Both of us are very pleased with the answers we get, whichever method of learning/communication we prefer. Nicely done, iCohere Support Team! We so appreciate your review, Jeff. Serving small-staff, high-results organizations is something we are passionate about. It is true that the iCohere platform is so feature-rich that it can seem daunting at first. That really is one of the core reasons we stay so involved with our clients -- to ensure every client ramps up smoothly and that they achieve their objectives quickly. We know that you and JRSA have big plans with iCohere, and we are thrilled to be your partner in bringing those plans into reality. Thank you! Pros: It reflects real-world knowledge of how people/groups work, what they need to do good work and communicate . Its design is integrative, e.g., recognizing how information and roles are interconnected, and thus it links resources for maximum accessibility with user-defined controls on what's needed where. Its design seems to have "thought of everything" - which gives me features as a user that are not only what I expect, but also that give me new ideas for what I can design in. Cons: I haven't run into any things I don't like. Overall: I first used iCohere 10 yrs ago for about a year to meet short-term needs of a small start-up organization. For a more substantive effort getting underway, recently subscribed because the brilliance of the integrative core design remains and such a full spectrum of new features are built around it as well as all the internet technologies now available. It seems its designers have thought of everything in advance in the most practical and forward-looking ways. Support is personable and fast in answering questions. User documentation is thorough and reliable. I'm very happy to be back using it and looking forward to exploiting all its features. Recommendations to other buyers: My main advice is that iCohere can be trusted to be absolutely thorough and forward-looking in ground breaking ways. After my first use of it 10 years ago, I continued to get all its product updates, and watched its progressive evolution into online conferences, LMS, etc. Its design is impeccable, and they never rest from continuing to innovate ahead of the curve. And nothing new gets released without the most thorough testing, another aspect users can trust. Pros: iCohere offers many features that let's you customize the setup of courses. The Classroom is very visual with image icons and pleasant for the learner. 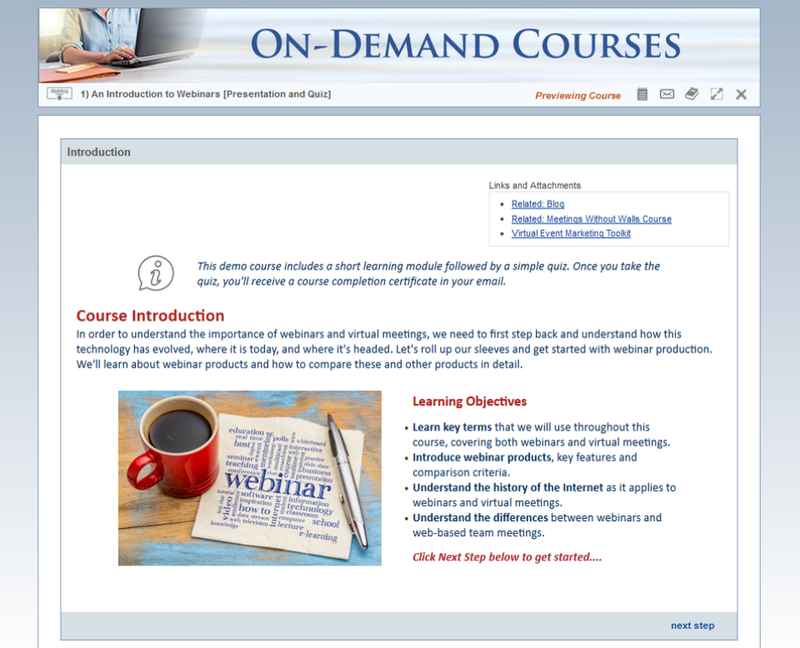 We had been using iCohere for our online courses and webinars. The first response as well as the developing team are both very responsive and knowledgeable. They are able to distinguish and help you with many issues along the way. If I were to pick, I think customer service would be the top of the list, following closely with usability and ability to set up programs the way you like. They will always work with you and help you get the features you need. Webinars through Webex are very easy to use and access. Cons: There are still few features that iCohere needs to work on, for example, SCORM is pass/fail only, where others offer ability to report more information from the course. Classroom is not accessible from mobile devices, meaning, if you have all your courses in the classroom, you are not mobile accessible. Thanks so much, Monika. We so appreciate the opportunity to support the good work of the American Society for Healthcare Engineering (ASHE). 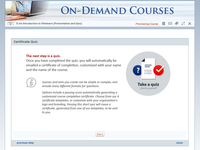 Your SCORM courses are highly interactive and engaging -- congratulations! Great Tool for Peer Learning Teams! Pros: Multiple valuable, features, customization options, and ease of use. Cons: A little bit of a learning curve on the administration side. Could be a little more flexible in terms of file/folder structure and rights, but iCohere has steadily made improvements in this area and continues to do so. Overall: For the past six years, we have used the iCohere platform for our national peer learning team program as a portal for participants to access team documents, colleagues contact information, event calendar, monthly webinars, emails, and more. It it fairly intuitive for our clients to use and us to administer. We also appreciative the responsiveness of iCohere to issues and improvement requests, as well as our ability to customize the interface. I'd recommend this tool for anyone interested in a "one-stop-shop" solution for online peer learning communities. Recommendations to other buyers: Great tool! Thanks so much for this terrific review, Sue. Serving your team, and your team's clients, is a pleasure & privilege for us. We especially appreciate your comment about "steady improvement" -- we take pride in listening closely to our clients and steadily evolving our enterprise platform to fulfill the needs of all our clients. Thank you! Pros: Flexibility to mix media (videos, etc. ), add tests and course evaluations without a ton of additional software. Cons: Although the program says it supports video files other than MP4, we couldn't get anything but MP4 to work. Overall: This is an excellent product for developing eLearning without customized programming or a large staff. We did our first course (about 2 hours) in 3.5 months (including training on the iCohere program) with three people working about half-time and no special additional software. Now that iCohere allows us to convert webinar recordings to MP4 ourselves (it did not allow this when we started in April 2016), it's even more convenient. Be aware though, that if you're going to have a high-quality course with intermittent tests (rather than one big test at the end), the demo showing a course being put together in an hour is a bit deceptive. 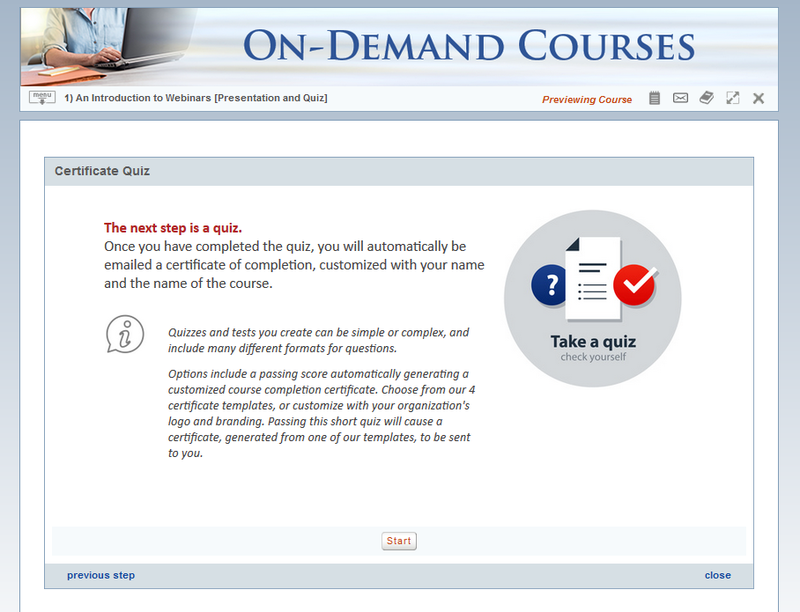 There are a lot of settings that need to be consistent, templates for introductions, test results, etc., that have to be developed, and more customization that needs to be done to make your course look professional. You should probably also ask "outsiders" to test it. As mentioned above, all that took three of us working about half-time over three months to develop a 2-hour course. Recommendations to other buyers: So far very worth it. Our first course only went live on 20-Jul so we don't yet have much feedback from purchasers. Linda we so appreciate this great, detailed review! The MP4 download example is great -- it took some serious development effort to get us properly integrated with Webex APIs and get those downloads available on-demand within iCohere! We did that automation work to simplify the user experience for everyone. Also regarding course development -- we're sorry it took you longer than expected to create that first course, but are glad that now you've got a solid template to copy for your next courses. We are privileged to support the important work of IPEC-Americas and so appreciate your support. Very user friendly, especially considering how many custom options are available. Pros: The best thing about iCohere is its user friendliness. It's easy to look at and to customize as an admin... and there are quite a bunch of ways to customize an iCohere site. Also, the company's client service is phenomenal. An iCohere staff member met with me via webconference on a weekly basis until I had the site fully built. She was always prompt and thorough if I had any inquiries/feedback. The staff member who helped me with setting up webconferences was also very helpful. Everyone from iCohere whom I've spoken to is very friendly. My company just did a soft launch of our new LMS last week and I'm very satisfied with my experience so far. Cons: Integration with my company's database has been challenging, which delayed the launch. As I mentioned, though, iCohere's client service is all that one can ask for, which made the experience much more smooth than it would have been otherwise. Eric we so appreciate your review. Getting NAMA launched with proper iMIS integration took a bit of tweaking work and I'm so glad to see that's ironed out and you're on the way -- exciting! Excellent customer support and a great product! Pros: iCohere is a very user-friendly LMS that offered exactly the technology we needed to launch our online training program. The customer support was particularly good - I would give that more than 5 stars if I could! iCohere was always available to talk us through any technical support questions we had, and to walk us through anything we needed to do to create or maintain our program. Cons: There are only 2 suggestions I might make. First, the interface requires a lot of pop-up windows, which sometimes looked a little cluttered for people going through our online program. Second, the price was on the higher side, compared to some of their competitors - but access to iCohere's excellent customer support balances a lot of that out. Thanks so much Torrey. It has been our privilege and pleasure to support the Beck Initiative's important work. Rest assured we're working hard on getting rid of those pop-up windows! Pros: It's user friendly even for those who are not Tech savvy and incredible customer service! Cons: This product really meet my needs for what I was looking for in an LMS. Overall: The customer service was better than any other LMS I considered contracting! They provide an immense amount of support to be able to build the classes. The interface is very intuitive and I was able to figure out a lot independently. They provide a great deal of training around the modules for creating a very comprehensive interactive appealing course. Pros: The platform is full-featured. We don't have to use all the features, but we can use what makes sense for our users now and still have room to grow. Cons: At the moment the basic design of the software is not as modern looking as I would like, but I know that the iCohere team continually updates the software and design will come along in time. Overall: In my current role and in previous jobs at other nonprofits, I have struggled with connecting members between in-person events. iCohere provides a comprehensive online platform, including webinar functionality, with which we can host hybrid and all virtual events and offer a year-round online experience that meets the specific needs of our community. We have just been using the "starter package" for the past few months, testing the basic features with a subset of our membership. We look forward to upgrading to the "all members package" and to rolling it out to our full membership next year. There is still a lot of work for me to do to develop our instance of the platform and to engage our members in a meaningful way, but I am confident that iCohere offers the tools, features, and support that will help us to make it happen. We so appreciate your feedback and such a great review, Mark. Supporting international executive organizations such as PPI is particularly valuable. It is great that we can partner to provide the tools you need to support your diverse global membership with webinars, communities and even virtual conferences. Thank you! Pros: It's intuitive, easy to use, can accommodate large groups of people, and the options for customization are very flexible. Overall: Not only is iCohere a reliable, excellent product for distance learning and collaboration, but the staff is extremely responsive and knowledgeable. They are a pleasure to work with. Impressive organizational DNA of care and respect! Comments: I want to update a July 2016 review I posted then, I was in the first few months of being back with iCohere after my earlier use of it 10 years before. Now, 10 months into this new subscription, yes, I continue to be very glad to be back, and I also have a bit deeper observation I think is worth sharing. My good experiences continue, from the new training webinars to interacting with Lance and Alex on our development needs. It struck me recently that the high levels of customer care and respect are just about literally the core DNA of the entire iCohere organization. And to connect that idea with the coherent growth-expansions of the nautilus iCohere uses to communicate its approaches, this DNA metaphor fits because DNA shapes our form and growth. I think it's worth waxing philosophical here for a moment because, in my experience, it's rare indeed to witness such consistency in the qualities that matter most in an organization over a protracted period of time. It bodes well for us current as well as future users! Pros: It can do so, so much, but isn't very hard to learn. Cons: I can't think of any cons! Overall: I tried another company, that went out of business. Then I tried a 'built from scratch' solution, that developed ongoing unsolvable issues. I then tried iCohere and couldn't be happier. Their team makes sure I know what to do because they are with me every step of the way until I feel comfortable going solo. The end result for viewers is a flawless presentation. Working with iCohere has really turned this part of our business around! Recommendations to other buyers: iCohere is a slam-dunk solution because the software product is excellent, but better yet, the people work with you in a friendly, thorough, patient and upbeat manner. It is delightful having iCohere as an important team member in the success of our company. Thanks so much for your review, Karen! Supporting Success for Children with Hearing Loss does such important work, it is almost unbelievable what you have achieved as a small-staff organization. And we are pleased to be in a revenue-share relationship with you, so your organization's programs can grow without having to invest in a lot of technology infrastructure up front. Pros: The ability to create forms and host webinars is extremely useful. They system can house large documents for download. Cons: The system is easy to use for the user but can be a little more difficult for the back end users to setup. Thank you for your review, Jessica. Our integrated webinar system and web forms module are indeed two very useful modules. Please let us know if you ever need additional help with setup. Pros: The software is very easy to use and the layout is great. I enjoyed being able to tailor the software for my organization's needs. Also, the customer service is absolutely amazing as I appreciated receiving a phone call or email checking in to make sure that iCohere was still working well for myself and the clients we work with. I would highly recommend iCohere to others. Overall: Easy collaboration, information sharing, and more. Thank you so much, Keshia. Supporting healthcare and medical nonprofits is super important to us. HCAN's support for rural health clinics is so important and impressive, we truly appreciate the opportunity to be of service. Overall: We have been pleased with the support, staff at Icohere from their CEO to all who work on the technical aspect and the reliability of their software. Sima, we so appreciate your 5-star review! It is our great pleasure to be assisting IPMA-HR with online education for your public sector human resource professionals. Comments: This product has helped us to communicate detailed reports and presentations to our board and other key players about our business and future strategic planning. This has allowed them to review the materials when they have the time and can pay attention to all the details as well as allowing them a platform to communicate through the discussion boards. We had a few glitches with people trying to use the software from multiple platforms, but they were few and easily handled by the excellent customer service with iCohere. I felt as if I had my very own expert who was at my beck and call whenever I needed help with anything. If he didn't have the answer, he took the information to people who did and kept me informed of the progress. I can't say enough about the customer support that we have received from this company! Now, if I could just get my employees to treat our customers that way. Thanks so much for this fantastic review, Terri. We are thrilled to be supporting IMG. I am forwarding your review to our engagement team and I know it will bring a smile to their faces! They truly do care about every single client's success. I meet with them every week and it always amazes me how much detail they know about how our clients are using, and want to use, our learning & collaboration platform. We appreciate your business, partnership and trust! Pros: Customizability and great support. Customer service makes a huge difference in the user experience! I also appreciate the availability of training and skill development through iCohere Academy. Cons: A little bit of a learning curve, but again the support is great. I would like a more streamlined interface, but every software has limitations and this is a personal preference. Thanks so much for your review, Kristen. We always s value your feedback as a leader & innovator in online learning. We're always working to make the system easier to use and the new iCohere Classroom is an impressive upgrade that I hope you will enjoy. Overall: We've been using iCohere for 9 years now and can't wait for iCohere 12 to come out next week. The iCohere support team are always willing to go above and beyond to help when questions come up. The integrated scheduling/marketing, recurrent meeting process and ability to pull our own MP4 recordings is going to be super helpful to us. Thanks so much, Katie, for this fantastic review. We are so thankful to be supporting the great work of EBPI. We appreciate all your feedback and -- yes! -- the iCohere team is very excited about iCohere 12, too! Pros: I have used this software as a learner. 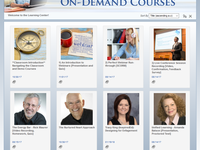 They offer many well-curated and well-produced courses lead by leaders in the education industry. It is very easy to identify assignments, collaborate with others,view live sessions, etc. Cons: I cannot think of any issues or deficiencies I've run in to as a learner. If I had to pick something, their GUI could use some updates, but that is purely cosmetic. Thanks so much for your review, we appreciate your feedback. iCohere 2018 includes the new Classroom interface that will, I bet, address those "GUI" concerns. Thanks again! Supportive team and platform for our very functional first virtual conference! Pros: We used iCohere for our first virtual conference, and their team was very supportive in helping us develop the virtual conference website; provided great checklists, scripts, and other materials to help us organize, plan, and moderate our sessions; and provided a very functional, intuitive platform for our conference. They were able to work with us to adapt their platform to suit almost all our ideas and needs for transforming our material into a virtual format, including discussion boards, workshops, galleries, and more! Cons: Use of breakout rooms for small group discussions during a live session would be a bonus! Otherwise, we were really able to get everything we wanted using iCohere's platform. Overall: We were able to transform an in-person training series into a virtual conference format, allowing us to increase access to presentations from our experts and live skill-building workshops. Our virtual conference was able to accomplish many of the same goals as our in-person trainings, but for a much larger audience (over 300 people), without requiring travel and other expenses from participants. Pros: The software worked as expected and even when they updated the software, there were no problems after that. It was pretty easy to get the conference platform up dealing with the iCohere staff. Cons: no Cons that I can think of. Recommendations to other buyers: Great company and software that can work with you. Pros: Designed with people in mind - how people talk to each other and interact, promoting excellent learning and dialogue on line. Cons: user interface could use a refresh. They want me to write more but that is really the major con from my point of view. Thank you for your review, Carol. We are about to launch iCohere 2018 with a new user interface for eLearning called the iCohere Classroom. Check it out, I think you will be impressed! Thanks so much. Pros: The software is easy to understand and use, however, the best part of iCohere is the support. From the initial training to ongoing support, the iCohere staff really go out of their way to make sure that you understand and are comfortable using the system. Overall: It has enabled us to improve our training and technical assistance in a cost-effective manner. We very much appreciate this review, Jason. It's very exciting to see what JRSA has already accomplished with the platform and your big plans for the future. Congratulations! iCohere's LMS is top-level and user-friendly. Employees are customer-oriented. Pros: iCohere is easy to use in all phases of the system, including the customization. We have launched more than 20 courses in the past year and the process was smooth. Staff were readily available and provided assistance quickly. Diane we so appreciate your review. It has been a great pleasure to see how fast ACA has ramped up -- over 30 sophisticated interactive new courses up & running in the first year -- Wow you & your team are amazing. Congratulations. Comments: I have been using iCohere for the last four years. When I started I was very nervous about learning something that appeared so complicated. As a psychotherapist and teacher my computer skills are basic.However, iCohere trained me well and supported me to achieve my goals. I have been able to reach hundreds of people all over the world in my virtual workshops. I was very tires traveling all over the US and the world. Now, with iCohere I can reach the world from my own home or office. Love it!! Ana thank you so much for this fantastic review. It is a privilege & pleasure to support your important work with therapies for children. Yes, iCohere is used by huge organizations, but we also are proud to support small-staff groups like Agate Institute. That's what partnership is all about! Our very first annual conference with a live-streaming component and virtual attendees. Pros: Users found it easy to use. The staff was made clear on what was expected from them. It was attractive and engaging to view. Cons: Flexibility of the graphic design of the landing page. It is not inexpensive, but it is quality for what you pay. Overall: We had a great launch of our first annual meeting with a live streaming component. Everyone was happy with the result. Attendees were asking for even more sessions to be broadcast. Thanks so much for your review, Deb. Producing hybrid conferences is a fast-growing part of our business and we hope to do many more with the fine professional groups at Kellen. The best training and support out there. Pros: The fact that it is a robust LMS, and that it offers users a wide range of options. The software is versatile and useful in many different ways. Cons: Need to do more to give customers a full understanding of it's capabilities. If many customers understood the benefits of iCohere, they would get greater use. Overall: iCohere gave my organization a tool to reach our many members throughout the world. Clark, thanks so much for your review. Serving the Library of Congress with our collaboration and meeting solutions is one of the highlights of my career and truly an honor for our company. Comments: My association signed with iCohere a year ago, and have just renewed our contract. We have had an amazing experience! They took the time to show us, step-by-step, everything we would need before we ever launched anything, and have been there every step of the way since. The team is always willing to help out, and the ease of use has been incredible. The only drawback is the lack of in-depth reporting, but they more than make up for it in other ways. Taking webinar classes for CAE credit. Pros: All encompassing. Lots of different types of information can be stored in the platform. Easy to login. One stop shop. Cons: Not as easy to navigate as other tools that I have used. Always struggle with finding my certificate after sessions. Thank you for this review, Heather. We have added a new icon -- now it's right at the top of every classroom screen! -- to access your transcript. We truly appreciate your feedback and help in making iCohere easier to use. Comments: iCohere is an outstanding partner in the development our e-learning courses, particularly Cass Dempsey and Alex White. They are always eager to try new ideas or approaches I have for the courses, and they constantly share insight for improving our future courses. They are collaborative and a pleasure to work with. The combination of their learning management system features and support is unparalleled. I highly recommend them learning management system provider. Thanks so much for this review, Aaron. Yes -- Cass & Alex are terrific! Our entire engagement team has one goal -- to make our clients successful using the iCohere platform. 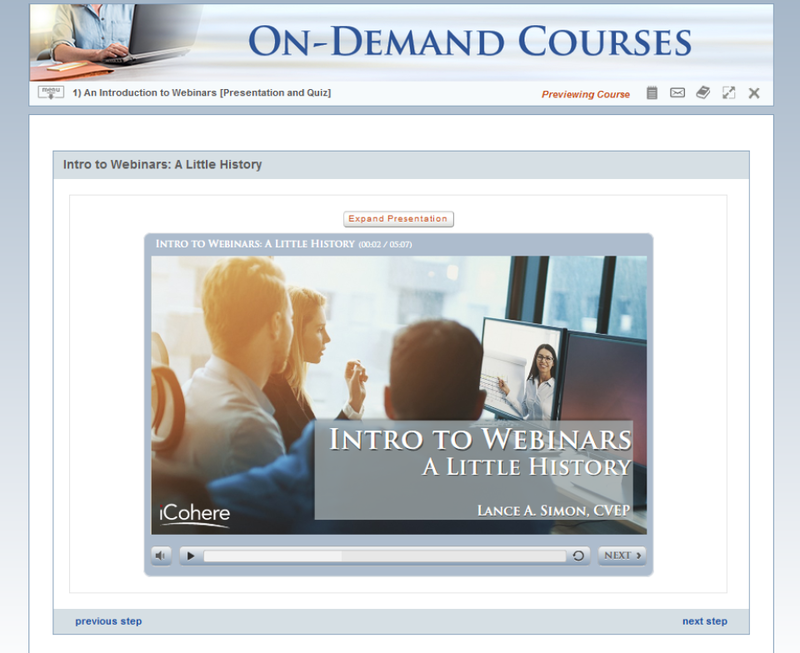 Since ALA uses iCohere for instructor-led courses and webinars, great training & support are truly critical. Great Service and Production for NAA's Virtual Convention! Comments: We have been so pleased with the virtual conventions created in partnership with iCohere. Both the production and service have been top-notch for two years in a row. Creating this virtual experience, with PD and networking opportunities, has allowed an affordable, high-quality experience accessible to our community members across the nation. Participants have had nothing but positive feedback and are already looking forward to our next virtual offering through ICohere. Pros: I liked the interaction and the content from this platform. Customer care is responsive, fast, and caring. Cons: I think it was a bit hard to navigate the system, there are many windows and it can be easy to get lost when initially orienting yourself to the platform. Thank for your for review, Alanna. We very much appreciate the feedback and am glad to have you using the system. Yes, we are dedicated to providing top-notch customer service! Pros: The software seems to be able to accommodate any business size including non-profit associations. The functionality was wonderful and little to no technical issues. Cons: There was an issue with multiple windows opening. Not a huge issue, but very interesting. This should be easily fixed on the back side of the software writing. Thank you, Carter. We're working on the "multiple windows/pop-up" issue. For example Articulate now open directly in the classroom page and video play without a pop-up. This is complex due to differing web browsers and devices but we're getting there! Comments: Here at National Farmers Union we could not be more grateful to have used iCohere to run our online conference. The staff and software went beyond our expectations and we were able to reach over 1,0000 new beginning farmers with this online tool! It was the best programming we have run all year and we would highly recommend it. Pros: Working at an independent learning center has it's advantages. Being able to this app to manage it all just made it that much better. It's ability to adapt to my teaching system is amazing. Cons: I wish there was more ease in using it from a tablet or your mobile phone. Very professional and very engaging. Pros: Does what it says it will do. I found it easy to follow and technical help was readily available. Great support staff. it is great! I did not have any problems following the support and it was very easy to use. The support staff is great! Overall: We were able to provide much more professional visuals and understand the needed steps to look professional in the visual world. Thank you for your review, Margaret. We put a lot of emphasis on our customer support, both automated in the platform and through our unified learning consultants. Testing the software by participating in a class to get the user perspective. Pros: Easy to understanding and follow, with good guides, clear language and indicators for the user. Moving through the system, back and forth was simple. Good prompts. Cons: The system opens too many windows, rather than using tabs. There is a lot of screen clutter, though it makes it more difficult to accidentally shut yourself out. Thanks so much, Valeria, for this great review. We know how important customer service is, especially in the first year of building an eLearning program. We are pleased and privileged to be supporting the important work of IPEC-Americas! Pros: Support staff Alex and Cass have helped us every step of the way. Cons: There is a little bit of a learning curve. Overall: We have been able to provide high quality virtual trainings for mental health clinicians around the world for the past 1 1/2 years. Thanks so much for this review, Debra. We are amazed at the breadth & depth of ATCI's offerings, and the positive impact you are having on so many mental health practitioners worldwide. It is a privilege for us to support such good work. Comments: The support team has been great. Any time I contact support@icohere.com they are quick to respond and fix issues and if there is not a fix for it they put it in the log to try to come up with something down the road. Thank you, Hope! It is our pleasure & privilege to working with CANBERRA to support online training. We appreciate it when clients bring us new ideas and make us stretch our capabilities! That partnering spirit is what has made the iCohere platform so successful over the past 15 years. Comments: I love the ease of use of the LMS interface, the WebX feature has already made our life simpler, but the customer service is hands down the best I've gotten from any place. I am so happy to have signed on with iCohere. Than you so much for this fantastic review, Willa. We are thrilled to be developing IAAO's new online education programs. Cass, your iCohere project manager, is fantastic, right?! We're dedicated to providing state-of-the-art technology AND hands-on, over-the-top support! Comments: Having worked with iCohere for years I continue to be in awe of the ease of use of their learning platform, their reliability in making things better than planned and their dedication to excellence. We continue at the Children's Success Foundation to look at more extensive collaborative possibilities with the great people in this dedicated organization. Thanks so much for your 5-star rating, Dr. Glasser. It is our privilege to support the important work of the Children's Success Foundation. Comments: Have successfully deployed four years worth of self-paced and facilitated online learning environments with this platform. Robust enough to compete with any other learning management system with much higher costs. Offers a unified learning experience to attendees across multiple programs and products/services. Micah, we so appreciate your 5-star review! Supporting NASFAA's financial aid administrator members and your professional team is a great pleasure & privilege for us. Comments: My association I work for hosts online conferences for members. We choose a fairly broad topic and offer multiple sessions for each conference. These conferences are easy to set up and when there is a problem the iCohere staff is helpful and easily solves issues. Thanks so much for this great review, Laura. We so appreciate the opportunity to support ASHA's important professional development programs. The team is what makes this platform exceptional! Comments: We have run several conferences and virtual events in the iCohere platform. Each event was well supported in strategy, design, and implementation by the excellent team at iCohere. Thanks so much for this 5-star review, Kristin. It is our pleasure & privilege to support the great, important work of Community Strengths. My experience with the product has been great. The notifications keep me informed and up to date! Pros: Networking with other CVEPs and candidates. I like the forums at the end of the lessons allow for deeper reflection and by viewing other posts I'm able to see different perspectives. Cons: Too many options. When I initially entered the platform, I was only interested in taking my training. It should have been available on the home screen instead of me having to search for it. Overall: I was able to build my network and I was able to recommend processes in my organization to further streamline our webinar program. Thus, I was able to walk away with real solutions that have proved to be beneficial. Thank you very much for this anonymous review! So glad to see you are getting good value from the platform including the community features. Pros: iCohere was easy to use and has great functionality. I never had any technical issues with the software. Cons: I would prefer access using fewer windows. It's a small thing, but I prefer to access content in one or two windows. Comments: I just want to say that my rep rocks. He's a great trainer. I appreciate his patience in getting me trained. Good job! Jennifer, thanks so much for this great review, we so appreciate it! It was easy to use from attendee perspective..
Pros: Great layout and easy to access/run on a PC. Materials easy to access and video was clear with all my lectures. Thanks so much for this review, Zane. Much appreciated.